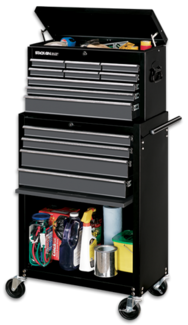 Spacious till area in the chest is perfect for storing larger tools. Includes steel lid support bracket and a full-length steel piano hinge. Cylinder, key-coded locks and steel locking bars secure the contents. Top chest packs inside cabinet for shipping.